Just a quick note today as I am trying to spend as much quality time with my family while they are available! It is hard to believe this was our last Thanksgiving before my sweet hubby and I become empty nesters next fall when our youngest goes off to college. However, I am quite confident she'll make her way home for turkey dinner next year (she loves to cook and loves homemade food). We had a busy week leading up to Thanksgiving. Our youngest had the entire week off, which was so nice. Things were going quite smoothly until my laptop got hijacked on Tuesday with the worst virus we have yet to come across! My poor hubby had to spend HOURS (more than 8) trying to get rid of it. So, beware...there is a new one out there that is a doozy!! It continuously hid ALL my files. Even once we got everything restored, I realized some things were missing. Well, they really weren't, just hidden. Such a pain. Just a reminder to BACK UP YOUR COMPUTER FILES REGULARLY!!! Thank goodness I did! I hope everyone had a wonderful and relaxing Thanksgiving Day with their loved ones. My sil cooked for our family and it was so nice to be able to sit and enjoy everything. Over the years our family as a whole has learned to slow down and simplify the holidays...we want to enjoy and remember them, not rush through them. Any of you joining the Black Friday madness???? I used to go out years ago, now I prefer to stay home and start my Christmas decorating. And, after seeing the headlines across the internet about people being shot, robbed and pepper sprayed all in the name of saving a buck...I am REALLY content staying home. I know it Christmas when they arrive! First, I want to say thank you to everyone for their kind words regarding my blog being "under construction". I have finally managed to get most things in place, and am very happy with how things turned out. I now have labels for all my past posts so you can easily find things, and I have a separate tab for recipes I have shared on my blog as well. My about me page has been updated a bit, and the house tour is coming soon! This has all been a learning experience for me as I have only been blogging a little over a year now. Well, you get the picture! Some things are serious, others just everyday things we often take for granted, and a few that are just plain fun. While the blog was under construction, we have been working on quite a few projects (the basement is now painted and almost ready for a reveal) and some super yummy recipes. Thanks for hanging in there with me! I am going to try and get the Teacher Gift series up for next week. No, I will not be found Twittering! I can hardly keep up with emails!! I wanted to share the new whimsical addition to our kitchen, along with another new love. 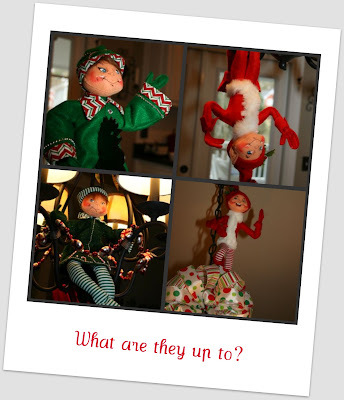 After reading Ashli's post, here, I loved the idea of adding a bit of whimsy to each room in our home. I came across these while shopping at West Elm last week, and thought they would be perfect in our kitchen. You see, I use olive oil almost daily, and love a good Balsamic vinegar! 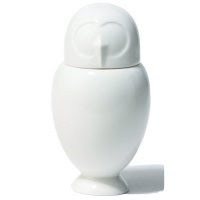 ﻿I also love this little owl sugar dispenser too. My other new love is the addition of our 3-tiered lazy susan in our corner cabinet. About a month ago, I had our cabinet maker out to the house. We wanted to change a few things in our kitchen, and add chunky frames to our bathroom mirrors upstairs (hope to post about those soon). I mentioned to him that I'd like for him to make some new shelves for our corner cabinet. You see, when we moved in 20 years ago, that cabinet had no shelving whatsoever! So, a couple year later hubby added some, but they never matched our others with the nicely round edges. My cabinet maker said to me, "dear, that was made for a lazy susan". Well then, why didn't Susan move in with us when we bought the house?!! He laughed, said, "would have cost you extra!" Typical of builders. So, we ordered one and sweet hubby installed it (wasn't as easy as it looks). We chose a 3-tiered version that allows each level to spin independently. I love it! We use lots of cups/water bottles/etc in our home as we are all about not buying bottles, coffee out (now that we have our awesome new Keurig), etc. And, if you are looking for an awesome water bottle, Camelbak's products are awesome!! I had hoped to share more photos of our family room redo, but one...a few things haven't arrived yet, and two...I have a sick child at home for 2 days. The doctors are switching her migraine meds AGAIN, and it's been a roller coaster of good and bad days. Hope everyone else is enjoying the Spring sunshine, it is a beautiful day here!! Hi Everyone! Hope you all have had a great week thus far. The past few weeks around here have been down right crazy, but we are starting to see the light at the end of the tunnel. The new carpet has been installed, the last of the interior rooms painted, and things are slowly making their way back to their respective places. We've done a TON of weeding out in the process. As you may or may not recall, my motto this year was to SIMPLIFY!!! And, that we have. It feels really good to be rid of excess stuff (my dad hates that word, what exactly is stuff anyway?!) Don't get me wrong...we still have an entire basement waiting to be decluttered as well, but the main living areas are just about done. I am loving not having to pick up 400 things just to clean a room! Earlier today, I decided to get our extra table linens in order. After purging soiled or outdated linens, I stacked each set of freshly pressed napkins and tied them together with some leftover burlap ribbon I had laying around. I carefully folded each of the table cloths, and once done placed all in this fantastic box I got at Ikea yesterday. Now all are in one place, and there is even room to add some new ones when the time comes. All neatly tucked in side with room to spare! The box is the Kajsa box from Ikea, is canvas with a hard bottom insert, so it breathes. Five minutes to a beautiful summer front door! Attach the two grapevine wreaths together, the smaller on top of the larger. This makes the wreath appear fuller. I used zip ties! 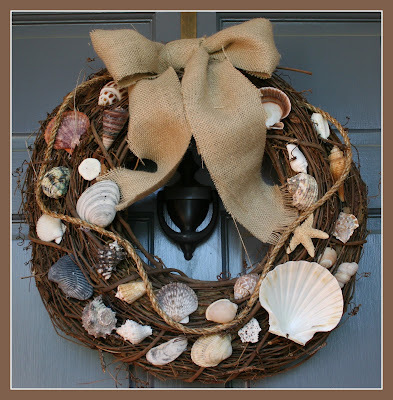 Randomly glue your seashells around the grapevine wreaths once assembled. Add some jute twine, and finish with a burlap bow (or ribbon you have on hand). Instant summer decor for your front door!! Hi, I'm Mari from Design Shuffle, a fabulous online gathering place for those who love interior design—both professionals and enthusiasts. 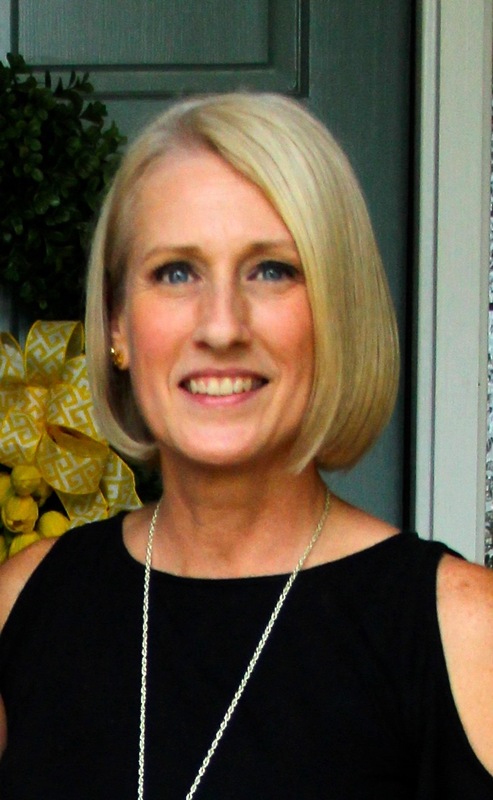 Today, I'm super excited that Lauren has invited me to visit Simply LKJ to do a guest post about shelves for books and more. Usually called bookcases, in today's interior designs these versatile built-ins or pieces of furniture are often actually shelves used for more than books. That "more" can be as varied as those who choose the objects to fill their shelves. Treasured collections, family photos, inexpensive but appealing decorative objects, priceless antiques—all have a place among the books. Here are eight rooms with shelves for books and more that grabbed our attention. Please enjoy! Small built-in shelves are filled with decorative objects, greenery and books covered in shades of white and cream. Framed family photos and an unframed drawing look great hung inside the bookcase. Open white shelving rises almost to the beamed ceiling in the living space of a Brooklyn brownstone. This is the perfect place to showcase the family's books and more. So beautiful behind the rustic dining table surrounded by white Panton chairs. Custom shelves hold everything at the ready for family dinners or entertaining. The white of the wood and the tabletop décor are striking against the dining room's sunny wall. Love the baskets along the bottom shelf. This one combines clever decorating ideas with open storage possibilities. It's easy to change shelves into seasonal or holiday vignettes. Simple wreaths and tree ornaments strewn among the books and white pottery show off holiday style. Behind floor to ceiling draperies that can be pulled or not, these tall wall to wall bookshelves seem perfect for this comfortable living space. Plenty of room here for books and more. The massive wall of white shelves is built to do a job and does it beautifully as part of the stylish interior design envisioned by Jenny Dyer in this lofty space. It's perfectly suited to hold the large collection of books and little else. This white bookshelf is filled with stacks of books coordinated in orange and turquoise to pick up the colors from the bamboo chair and area rug. In a truly unique dining room, this beautiful bookcase is more art than storage. The books are lovely antique volumes and the stunning decorative objects are pulled from the sea. Love the amazing chandelier. Thanks to Design Shuffle for stopping by today! Stop by the site for more inspirations from top interior designers including New York interior designers to Los Angeles interior designers and more. Sorry for the lack of posts lately, we are in crazy mode gearing up for the holidays around here! While we don't spend much time on Halloween nowadays (the girls are older), Thanksgiving and Christmas will be upon us in no time! Our youngest daughter's MRI on her foot showed only swollen tissue, no tears/breaks, so we are so very thankful she will not be facing surgery in the near future. Our oldest is preparing for finals and graduation from college...she "officially" made the grad list (according to her text to me). I jokingly told her I could now plan her grad party (already was, but had to razz her a bit!!). Our youngest has her senior volleyball banquet on Monday, and after that I can hand all of my duties off to my predecessor! Thank goodness!!! I am ready to move on. 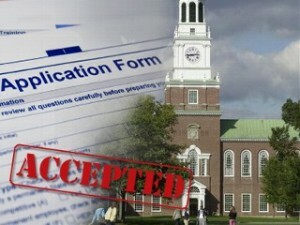 Our youngest is two for two on acceptance letters! She got into her sister's alma mater, Kennesaw State University...and this week was officially accepted to Baylor! We are so proud of her!!! 6 more to go, but she is off to a great start. This is such an exciting time in our lives, as we watch one graduate from college and one prepare for college. Some would be sad seeing their kiddos leave the nest, but I am super excited for both of them! They are good kids, who have worked hard, and I am so blessed to see them succeed! I hope to post more often in the next few weeks as things settle into place. Be on the look out for my "Teacher Gift series"...a mom of an almost 22 year old and and 18 year old has lots of ideas! !